The last few days have made this explicitly clear, as a freshly minted Trump administration has begun to wage what sure looks a lot like a war on science. In the past week, the White House has placed communications restrictions on the EPA, the USDA and the National Park Service. It has scrubbed references to climate change from federal websites. And it has entertained champions of thoroughly debunked misinformation for scientific advisory roles. The scientific community has responded with fury, defiantly countering the Trump administration’s “alternative facts” on social media and mobilizing to organize a massive march on Washington. 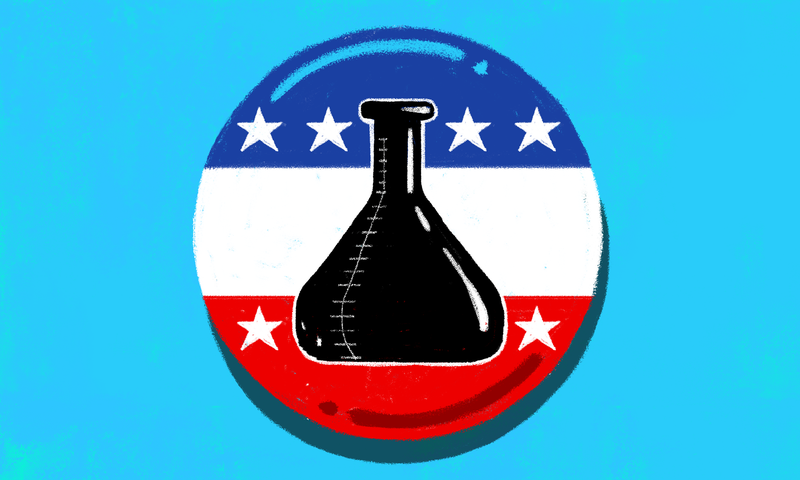 A growing number of scientists are even now considering seeking public office themselves. In just two weeks, more than 400 scientists have expressed interest in running for office via the recruitment form on 314 Action’s website, which for now is only backing Democratic candidates. With Trump in power, the only way to effectively fight back, it seems, may be from within the hallowed halls of our ailing democracy itself. But this is not really a new war—just ask any scientist working in a controversial field like genetic engineering or climate science. The funding and regulations that dictate scientific research are often rooted as much in Washington deal-making and public opinion as any scientific fact. Those things can stymy a scientist’s ability to do work. Take restrictions on the so-called 3-parent-baby technique, a genetic-engineering method designed to prevent devastating mitochondrial diseases. The technique is banned in the US, primarily due to ethical concerns over what editing human embryos might eventually lead to. New mandatory GMO labeling laws are similarly anti-science. So is the Congressional ban on gun research. Even so, within the scientific community, it has long been controversial to treat the business of science as politics. Scientists in those more politicized fields also frequently face torrents of harassment and death threats. One 2015 report from the Union of Concerned Scientists warned that harassment in particular had gotten so bad in the scientific community that it was in danger of compromising the basic ability of scientists to do science. “The last few years has really shown us that we need to encourage scientists to get involved,” Naughton said. Naughton ran for Congress herself in 2014 and 2016 as a Pennsylvania Democrat, but lost both times in the primary. Indeed, a growing cadre of scientists have called for more openness and dialogue with the public, especially when it comes to the sorts of controversial scientific endeavors that increasingly directly impact the public. Still, while more scientists may now be advocating for their colleagues to play a role in spreading the gospel of science in the public sphere, rarely does that translate to political involvement. In all of Congress, there is in fact only one person with a science Ph.D., Bill Foster of Illinois. It did not take Trump in the White House for the House Committee on Science, Space, and Technology to send out a link to a scientifically-suspect Breitbart story claiming a “plunge” in global temperatures last December. The Committee has been spiraling down an anti-science rabbit hole since at least 2012. What’s changed under Trump is that his administration has made it clear that if you are working as a scientist in the federal government, your work should be consistent with the views of the current administration. And many of those views fly in the face of well-worn scientific evidence. Mere facts are very clearly no longer enough to fight back, if they ever were to begin with. If Trump’s rise to power has shown us anything, it is that the truth is malleable. Facts have always been political propaganda—whether you’re a climate change denier or an environmental activist. There are many good reasons why scientists hesitate to frame science as political. It risks alienating funding sources, regulators and the public. It risks turning something that seems pure—a search for answers, for facts—into something subject to human ego. But Trump’s early moves, it seems, are marking fears of those consequences seem small. Much bigger, now, is the fear of remaining silent.